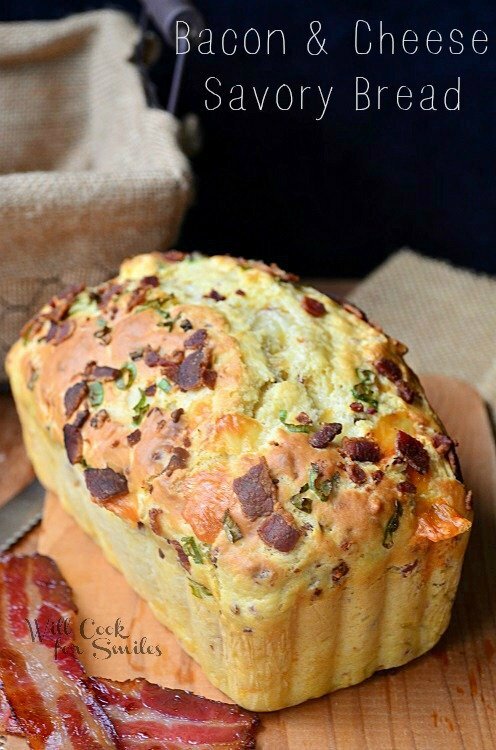 Father’s Day week continues with Bacon & Cheese Savory Bread! 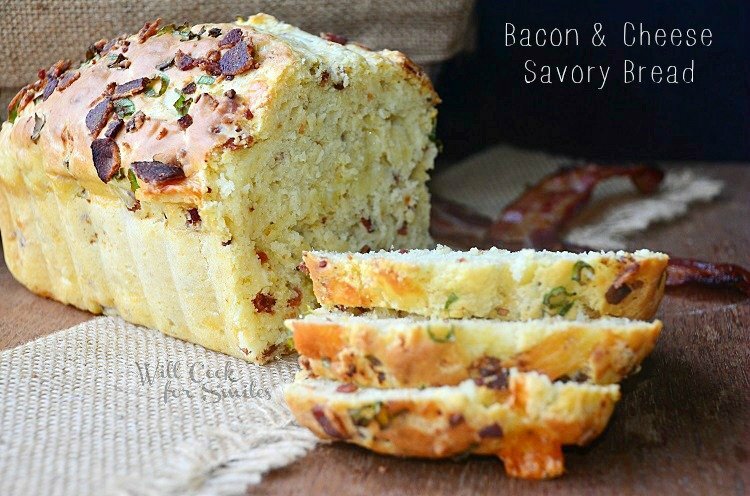 It’s a soft, moist and delicious bread made with crispy bacon and sharp white cheddar cheese! Originally, I wanted to make a “Dad” kind of muffins for breakfast, for my husband. I thought that savory muffins with bacon and cheese would be perfect to wake up to. Apparently, I was wrong! That’s what my hubby said to me. Haha, I didn’t ever realize that muffins were not manly. So I suggested savory bread and he was happy about that. I got some nice applewood smoked bacon and baked it for a couple extra minutes to give it a nice crisp. I also got some extra sharp white cheddar for a more flavor. 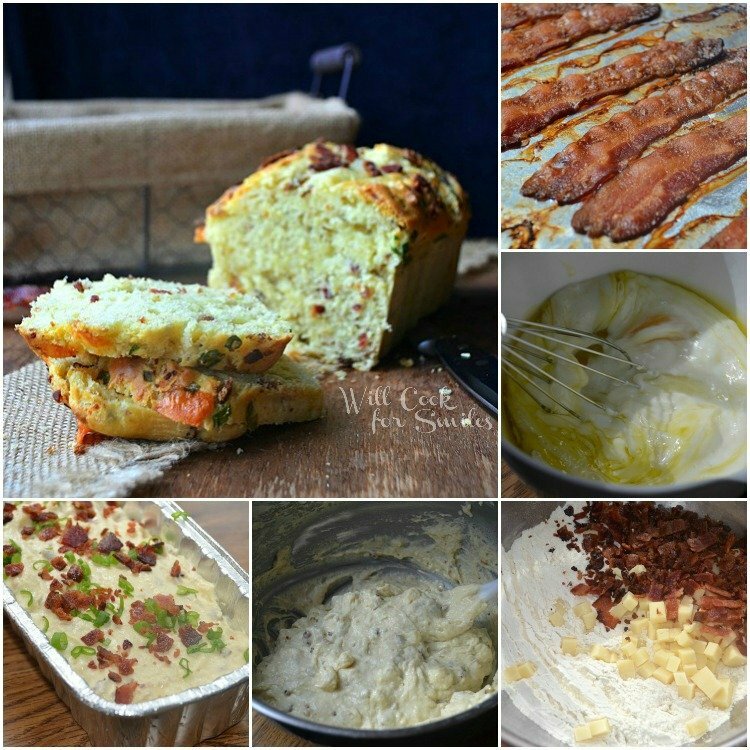 Bacon lovers are guaranteed to be in food heaven! The bread didn’t last two full days between the little man and the big man! 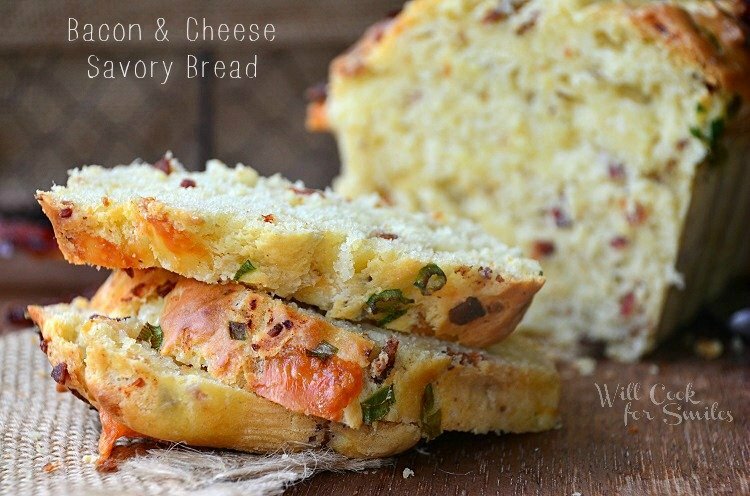 It's a soft, moist and delicious bread made with crispy bacon and sharp white cheddar cheese! Add the crispy bacon and cubed white cheddar to the four and mix until all incorporated. Sprinkle the chopped green onion and bacon bits over the top. Bake for 45-50 minutes (until the toothpick inserted in the center comes out clean. 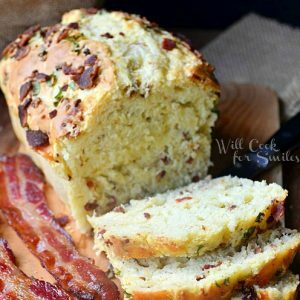 It would be awesome if you could stop by and link this recipe up at Tasty Tuesdays – the theme is Man Food and I don’t know one guy who wouldn’t LOVE this bread! I am going to try this with gluten free flour. Crossing my fingers because it looks amazing! You’re killing me here! I haven’t even gotten to try the other savory bread yet. But this one looks so good, I guess I’ll be trying two loaves this weekend. Haha, that’s exactly what I was going for! This bread is SO amazing! I’m totally making it sometime! This looks so good. You’re making me hungry. Thanks for the inspiration. This looks INCREDIBLE! Wow! Pinning it now, thanks for sharing! Ding, ding, ding, we have a winner! My family will eat anything w/bacon & cheese in it so I not only won’t have to it all myself but I will be fighting for my own piece! Thanks! 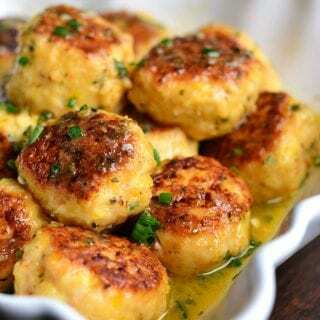 wow MY…this looks heavenly with bacon and cheese! everything is better with cheese…but even more so with bacon. yum! Oh my goodness you had me at bacon. 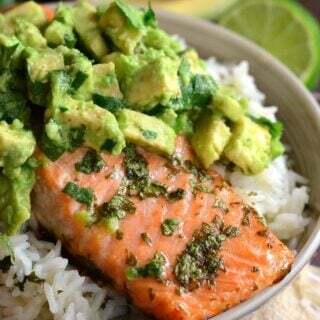 This looks so yummy!I have pinned it am trying soon! Found you over on The Country Cook’s linky party. This looks delicious. What is not to like about this. I think you succeeded with a wonderful bread. I have to try this soon. We are having a party tomorrow at Tumbleweed Contessa – Saturday Dishes featuring breads. I’d love it if your brought this over. Hope to see you there. This looks too good to pass by ….Pinned! 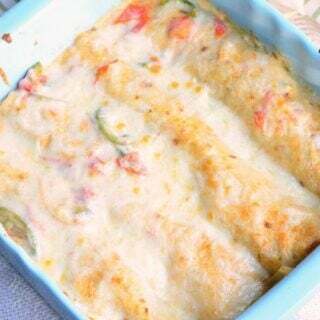 I want to make this now but it is 9 p.m. and I’m too tired! Thanks for the recipe! Mmm this looks amazing! Pinning to save for later – thanks for sharing! 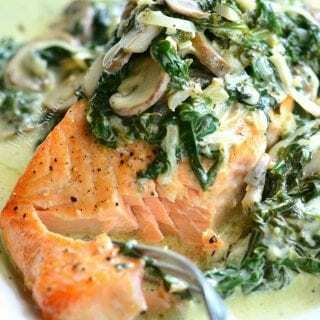 Thank you so much for this recipe Lyuba! It looks amazing. I am pinning it right now! Thanks also for linking up to the Say G’day linky party! I so appreciate your support and bloggy friendship. This looks soooo good! Pinning to try it. I pinned this so I can try it soon. It looks amazing! Haha no I guess muffins are not very manly. This bread looks delicious though! Thanks so much for sharing! 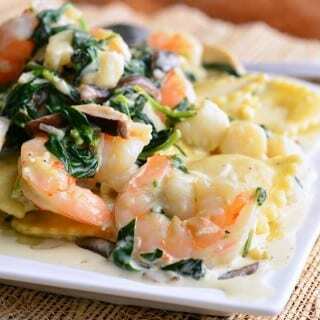 this looks good, I would try it but would add some Parmesan cheese and some black chopped olives. That sounds good! Thank you, Chadia! This looks amazing! What flavor. Who doesn’t love bacon and cheese?!? This looks amazing! 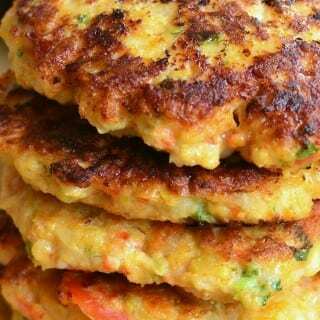 Will try this on Friday to serve with my three bean soup. Nice to find a bread where you don’t have to fool around with the yeast and yet it looks like it rises nicely. Probably with just the benefit of the bread flour and buttermilk?? I love no yeast breads! Thank you for the sweet comment, Robin! I have a question : do I need to cook the bacon and then add it to the mixture ? Or can I put it in the mixture and it will cook with the bread ? Yes, the bacon should be already cooked. It won’t have time to fully cooked inside if used raw and it won’t be crispy.